IT teams, MSPs and ISPs need to rapidly provide an optimal network experience for users and devices. Network operators are seeking simplicity, flexibility and automation to improve performance. Cloud Networking solutions with cnPilot™ Wi-Fi, cnMatrix™ switching, and cnMaestro™ cloud management from Cambium Networks deliver an optimal client experience while maintaining robust security and reducing cost. 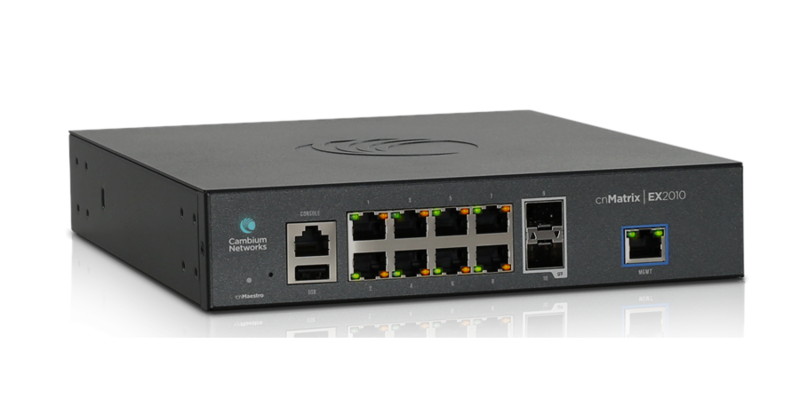 A proven leader in providing global communications solutions, Cambium Networks simplifies network operations. Our Cloud Managed Intelligent Edge Enterprise Access Solution makes the network resilient, easy to operate, high performance, and agile; providing cost effective wired/wireless connectivity for network operators. The entire purpose-built end-to-end network is managed from a “bird’s eye view” by the free cnMaestro management system. The cnMatrix series of fully managed switches delivers full Layer2 and Layer 3 capabilities with enhanced access security. cnMatrix switches deliver power savings with several models offering fanless operation. The cnMatrix switch series offers flexibility with 4 – 10 Gbps (SFP+) uplinks on the 28 port models while offering 2 - 1Gbps (SFP) uplink ports on the 10 port models.